Inneholder en stor seng eller to enkeltsenger. Self catering, alle moderne innretninger. Bad med dusj, smart tv, wifi. På veien parkering, sykkel lagring tilgjengelig. I nærheten av alle gode shopping- og bymuligheter, og for turer langs elvebredden og inn i åsene, sykkelruter. Enkel tilgang med buss til Edinburgh, eller til grensene byene. Peebles er en travel by med mange spisesteder, et teater, bibliotek og museum, kunstgallerier og mange pågående aktiviteter for å delta. Det vil bli mye verdsatt hoovering noen hund hår i leiligheten før du drar. We will hope to return. Perfect location, very well equipped to a very high standard. This wee property was just perfect for my night away in Peebles. So conveniently placed with everything provided and so many lovely extras thrown in! An amazing home from home. I am very happy to know you were comfortable and enjoyed your visit to the cosy studio flat. It was a pleasure to have you. Thankyou for your appreciative review. A comfy, clean and nice place. Perfect for a weekend getaway. The place was relaxed and quite allowing for an escape from the city. 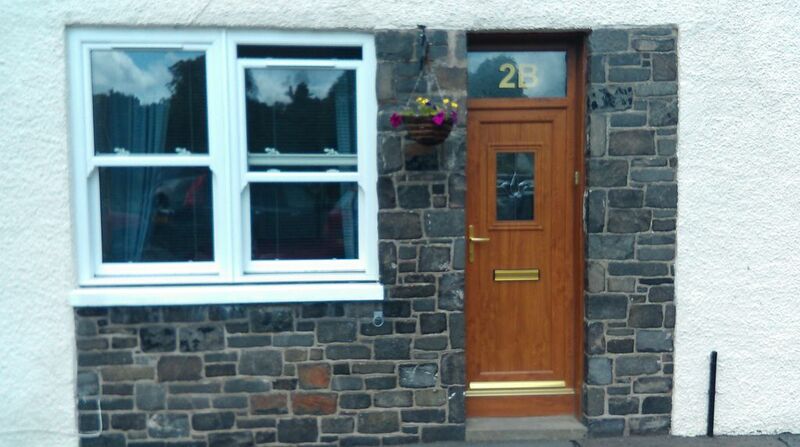 Quant little flat in lovely histotric village near the river Tweed. Thank you Julie for a warm welcome, I felt at home immediately. The place was immaculate there was everything you need and more. You can just walk across the street and you are on the riverbank where you can walk to your hearts delight. Peebles is such a beautiful little gem. If you want peace and quiet its the place to visit. I can really recommend Julies place 100%. I'm very happy to know you enjoyed your stay to my flat. It was such a pleasure to meet you and I am glad you were able to appreciate the beautiful and tranquil surrounds beside the river and explore the little town of Peebles with all its quirks. Lovely and clean, excellent location. Peebles er en livlig liten grenseby med utmerkede shoppingmuligheter, et teater, mange spisesteder og spisesteder. Det er mange flotte steder å gå, langs elva eller i åser og skoger. Det er også et svært viktig sykkelområde med Glentress terrengsykkel sentrum. Edinburgh ligger 20 miles unna. Departure by midday. Entry after 2pm.